Are you an Old? Is using technology difficult? Don't worry because your devices are becoming sentient. Soon they will know what you want and be able to help you. And then steal your medicine while you're asleep. Until the machines have full self awareness, though, we still have to rely on good-ol' reliable humans. You know, that sack of meat that is your body which you don't really consider your body because you think with your brain and your brain don't care, honey. So humans. You've probably seen the Amazon commercials by now--they've been out for a few weeks. 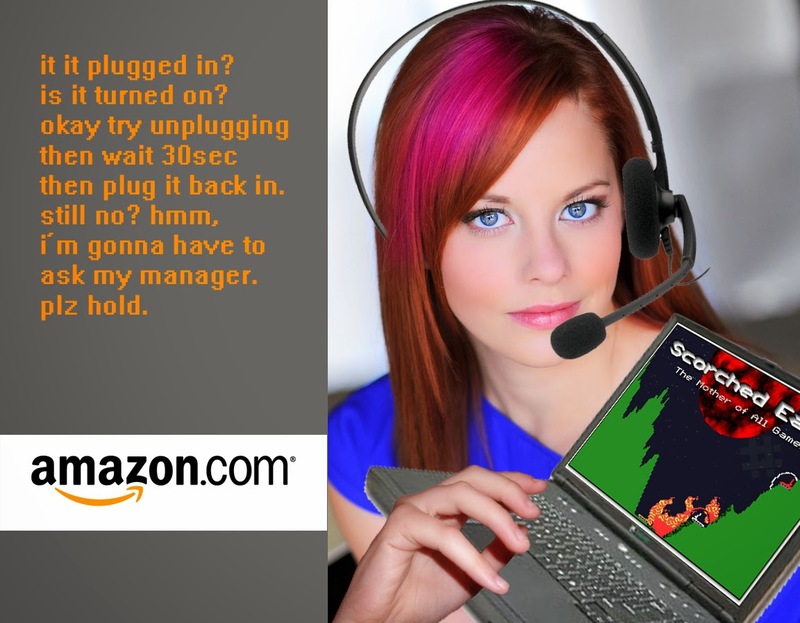 In the commercials a person is having a difficult time using his/her technology (in this case, some version of the Kindle Fire that Amazon is promoting). And instead of becoming frustrated and hurling the tablet out of the window or into a wall, this person presses the "Help Me" button on the device screen. Before 2013, this would have opened a FAQ box with a convoluted answer tree and a stupid Back button that would make you start over instead of hopping back a notch to the parent topic you were exploring. Then when you finally find the Q that is FA'd, the answer is totally vague or inadequate and consequently you stop learning to do what you're trying to do and just give up. Give up, man. Just give up. Now we're getting to the real meat (stop saying meat) of why I wanted to explore this topic. Amazon Amy. The helper person that pops up on dude's Kindle is a medium-youngish looking white chick with red hair that has purple highlights. She has kind of an Emma Stone vibe about her. What is Amazon doing here with this nice young lady? Okay, so Amazon is targeting young, straight, male buyers. Who else, right? Because men have jobs and make money while women stay at home cooking (recipes they found on pinterest using their tablet). This is a fallacy. Fallacy number 2: if they are targeting this demographic then they have to realize that young males are one of the least likely groups to require a help service. The third flaw with this presentation is that in reality you will probably get a middle-aged male in India helping you find out where you downloaded that book (it's in your media folder...no, click back. not home, no, okay. see on the top right the yellow square? yeah beneath that). Maybe I don't know. I've never called Amazon Help. Amy. How long will she live as a character? She's been in multiple commercials, proving that she wasn't just a one time thing. Are they trying to make her a Progressive Flo? Wendy's has Wendy, but Wendy is integral to Wendy's. Progressive doesn't necessitate Flo and Amazon, similarly, has historically done alright without Amy. In fact, the once upon a time novelty of the character Flo has devolved into one of the more annoying media personalities. Like Flo, Amy has a lot of potential to become a grating character. Like Wendy: hot redhead. Now that I say it out loud in print, Wendy's Wendy has also become somewhat annoying. I did a Bing Search for Amazon Amy. Her real name is Amy. Amy Paffrath. She's 30, is a Cancer, and was in the hit film Gingerdead Man vs Evil Bong. Her IMDB credits list is actually pretty stacked. So we'll wait and see how Amazon uses Amy. Have you been to Google lately? No not the place in California. Yeah, when you open the internet. That one. I know I usually Bing too, so it's only because I check a lot of internet pages daily looking for changes that I even saw this. Look there right beneath the search field. It says, "New! Get real help from real people in real time. Helpouts by Google"
This is a trend that you can expect to continue to grow. Unfortunately. You see, when I use the internet, I don't want to interact with people. That's why I'm using the internet! It's so amazing that you can order pizza online without having to call the person. Plus you can spend all this time reading toppings and visualizing the perfect pie. And Google...shoot, man; you're already on the page of where to go if you don't know how to do something. Just type your little thing into the box. In fact, I bet if you Google Helpout, you'll just get a person that will Google your question and then say the answer to you. What's more, these services are taking away jobs from teenage neighbors and relatives everywhere. We need to keep the jobs in America, in our communities. And sure, these services are free now, but what happens when they find out it's expensive to help people and start charging micro payments. Pretty soon it's costing you $1000 a year to Google things. In summary. Amy. Help on computers. Future. Thank you, goodnight.